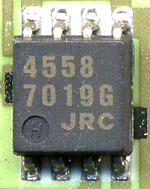 NJM4558M NJRC SOP8 DMP8 8 OP-AMP for general purpose. SOT-89 - 3(4) 3-TERMINAL POSITIVE VOLTAGE REGULATOR. NJX1542 NJRC - SMD ceramic package 2 GaAs varactor diode for SHF S~Ku band high frequency VCO,detector. SOT-89 - 3(4) 3-TERMINAL NEGATIVE VOLTAGE REGULATOR.